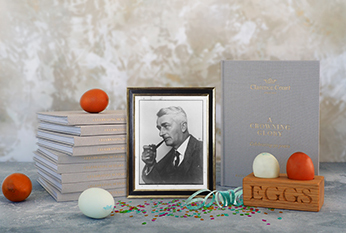 To mark the 137th anniversary of Clarence Elliott’s birthday, the botantist and famous explorer responsible for bringing golden yolks to the UK, we share his remarkable story – the name behind the crown. It starts in 1928, when Clarence Elliott arrived in Stow-on-the-Wold in Gloucestershire after his epic journey from Patagonia. Stowed in the ships hold was a very extraordinary cargo, a giant, 100 year old Galapagos tortoise, two pygmy deer, a number of edible frogs, some exquisite alpine flowers from the foothills of the Andes – and three Araucana hens, laying pastel-coloured eggs. 90 years later, Clarence’s three Araucana hens have yet a more enduring legacy. Sent to Cambridge University, these rare birds were crossbred to create generations of pedigree hens that to this day lay beautiful, colourful, hard-shelled eggs with the deepest golden yolks and rich, superior flavour. Sporting the distinctive ‘muffs’ and ‘crests’ of their earlier South American relatives, Clarence’s three birds became the foundation of our premium collection, which is loved by so many top chefs, home cooks and foodies today – just as they were all those decades ago. Stars in their own right, one can only imagine the thoughts of Clarence had he known the influence of his three Araucana hens 90 years on… we say he’d be delighted! Pictured is Clarence Elliott, taken in 1927 by his father John Elliott and uncle Clarence Fry, portrait photographers ‘Elliott & Fry’ during the 19th century. A famed horticulturist who specialised in alpine plants, he is remembered today by his grandchildren as we see pictured – always dressed in a three piece suit with a pipe in hand!